Brief: Every year in Poland, more women die because of breast cancer than in car accidents, because of late diagnostics. Most women know and perform – although not regularly – breast self-examination. They perceive this technique as sufficient for breast cancer diagnosis. They think further examinations are not required. That’s why only a few sign up for mammogram scanning.We wanted to change this perception by communicating “What a person can miss the machine will find”. Stressing that mammogram scanning is by far better and more accurate in diagnosing breast cancer, and that women should use it on a regular basis. Development: When the Federation of Amazonki approved the idea, we approached the Ministry of Health to get their patronage as well as the Oncology Center in Warsaw. The 2nd step was to find an appropriate partner of the action. H&M agreed to participate and support the event. H&M in Poland has a wide range of customers in different ages, from teenagers to women being 50-60 years old. Also, a very positive image of the brand helped to create a friendly atmosphere during the action. The event took place in H&M premises in the central part of Warsaw. Results: There were 330 tags given away in 2 days and the website was visited by 1,650 unique visitors, strongly indicating the word of mouth power of the action. The number of phone calls increased 10% in comparison with the before-action results. Post-action effect continues when women visit other stores and hear the beeping. 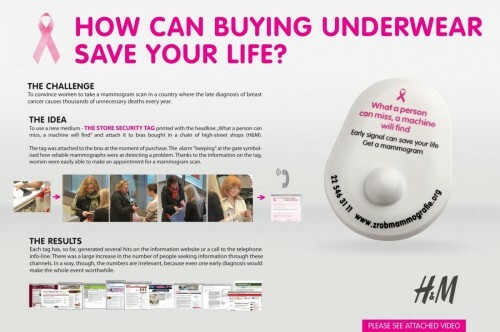 Method of promotion: We wanted to draw women’s attention to the “breast issues” at the most appropriate moment: when buying a bra and in the place where they would never expect this kind of communication. The mechanics of the action explained by itself the way a mammogram test works in a very simple but suggestive way: the gate beeps when you pass by and it turns out there is something in the bag you would not expect to have. Thanks to the information printed on the tag, women were able to quickly and easily make an appointment for a mammogram scan.